Read Cordell & Cordell reviews. THIS IS AN ATTORNEY ADVERTISEMENT. CORDELL & CORDELL, ST. LOUIS, MO. 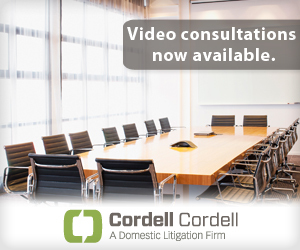 Attorney services are provided by licensed attorneys in every state where Cordell & Cordell offices are located. The choice of a lawyer is an important decision and should not be based solely upon advertisements. No representation is made that the quality of the legal services to be performed is greater than the quality of legal services performed by other lawyers. FREE BACKGROUND INFORMATION AVAILABLE UPON REQUEST.